Saturday, Sept 1 at noon and 2 p.m. at the Moses Lake Civic Center. In partnership with the Moses Lake Museum. 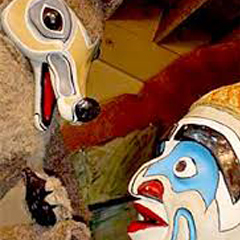 Coyote Tales by Tears of Joy Theatre is a compilation of two trickster tales, performed with puppets, masks, and costumes inspired by Pacific Northwest Native American art. Learn Native American words, songs, and trickster tales of how things came to be. Show in partnership with the Moses Lake Museum. 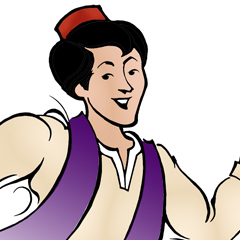 For Aladdin, it’s not easy to find a magic lamp but it’s even harder to get a date! It’s a swirling sandstorm of famous Arabian Tales from Ali Baba to Scheherazade, and even Sinbad the Sailor, as Aladdin journeys to find a magic lamp in a Cave of (not-so-great) Wonders. Along his way, Aladdin seeks answers and advice from wise Genies, a powerful Sultan, and his own Mother to find a way to meet the Princess. However, even with the lamp in hand, Aladdin will have to learn that it takes more than a wish to make a good impression. Full of memorable characters, from lost Penguins to talking Palm Trees, this is an adventure worthy of 1001 laughs. 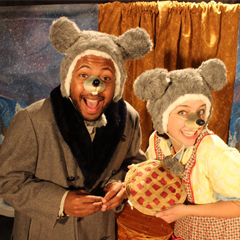 Bright Star Touring Theatre, a national professional touring theatre company based in Asheville, NC, is visiting the area with a public performance of their acclaimed show Winter Fables. Winter Fables is a cozy little show where Aesop’s famous fables are brought to life with some amazing winter-inspired tales. Our spirited performers take your young audience on a hilarious and highly entertaining journey. They cover valuable lessons from ‘The Ant and the Grasshopper’ to ‘The Country Mouse and the City Mouse’. Your young audience is guaranteed to walk away with strong character-education influence and a boat-load of uproarious laughter! They’ll learn about responsibility, honesty and appreciating what they already have just in time to get into the spirit of the season.